Bentho-pelagic fish utilize both bottom habitats and shallower portions of the water column, often feeding in shallow water at night and moving to deeper water to form schools during the day. 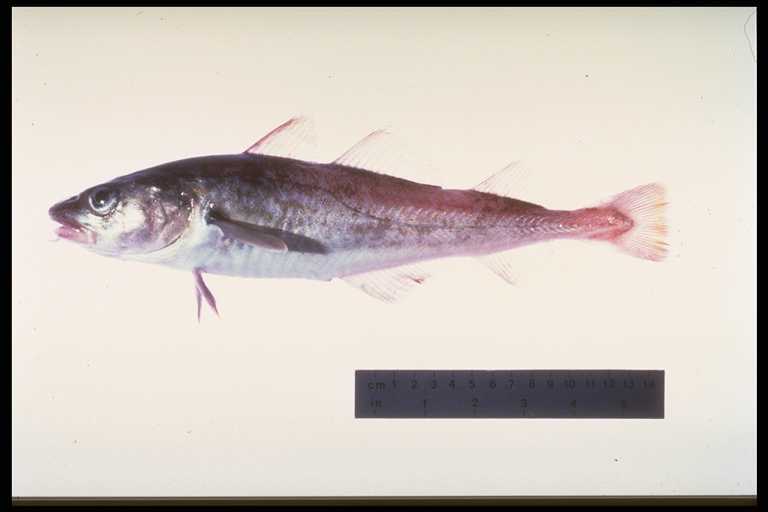 Pacific Hake (Merluccius productus). Image courtesy of NOAA. Four currently or historically important species of bentho-pelagic fish in Puget Sound are the Pacific hake (Merluccius productus), the Pacific cod (Gadus macrocephalus), the Walleye pollock (Theragra chalcogramma) and the spiny dogfish (Squalus acanthias). Three of these species (Pacific hake, Pacific cod and Walleye pollock) were included in a petition for federal listing under the Endangered Species Act in 1999. Pacific hake (also known as Pacific whiting) form three spawning stocks in the Northeast Pacific: a coastal, highly migratory stock, a Strait of Georgia stock and a Puget Sound stock. Currently the two inland stocks and the coastal stock are federally recognized as Distinct Population Segments (DPS) based on genetic, demographic and behavioral differences (Gustafson et al. 2000), however more recent genetic evidence suggests further subdivision between southern Puget Sound and Strait of Georgia populations may be warranted (Iwamoto et al. 2004). In Puget Sound, Pacific hake form large seasonal spawning aggregations in Port Susan which was the target of a substantial fishery for many years (Pedersen 1985). Spawning activity has been also reported in Dabob Bay (Bailey and Yen 1983). Spawning in Puget Sound is thought to occur primarily from February to April (Gustafson et al. 2000). Pacific hake produce pelagic eggs which develop into larvae that feed primarily on copepods (McFarlane and Beamish 1985). As juvenile and small adults, the diet of hake is primarily euphausiid crustaceans which also undergo diel migrations (e.g., Mackas et al. 1997). Large adults consume a wide array of prey including amphipods, squid, Pacific herring, crabs, shrimp and juvenile Pacific hake (McFarlane and Beamish 1985, Gustafson et al. 2000). Pacific hake are also important prey for a suite of predators; this group includes walleye Pollock, Pacific cod, rockfish, spiny dogfish and marine mammals such as sea lions (McFarlane and Beamish 1985, Gustafson et al. 2000). Pacific hake in Puget Sound are believed to reach maturity at approximately 30 cm and 4-5 years of age; they can live for up to 20 years and reach sizes of 73 cm. The size at maturity and average body size of Pacific hake Puget Sound are reported to have decreased in Pacific hake from the 1980s to 2000 (WDFW data)(reported in Gustafson et al. 2000). Pacific cod occur in the Northeast Pacific occur from Alaska to California. Adult cod typically occupy deep habitats (50 – 300 m) and have been historically been observed forming spawning aggregations at multiple locations throughout Puget Sound (Palsson 1990, Gustafson et al. 2000). Although the review conducted by Gustafson et al. (2000) did not find conclusive evidence of population differentiation of North American Pacific cod, more recent otolith (Gao et al. 2005) and microsatellite (Cunningham et al. 2009) studies suggest that inland (Strait of Georgia and Puget Sound) populations are distinct from the coastal stocks. Pacific cod typically mature at 2-3 years of age at approximately 45 cm, with an estimated maximum lifespan of 18 years. Pacific cod occupy different habitats throughout their life cycle. Eggs are typically found in demersal habitats followed by a transition to the pelagic zone as larvae and small juveniles, settling to intertidal or subtidal sand or eelgrass habitats as large juveniles and moving to deep water as adults (reviewed by Gustafson et al. 2000). Juvenile cod feed on crustaceans such as shrimp, mysids and amphipods; the diet of adults is though to reflect the relative availability of prey with some preference for walleye pollock in large (>70 cm) adults (Gustafson et al. 2000). Pacific cod are preyed upon by a variety of predators including pelagic fishes, sea birds, whales, halibut, shark and other Pacific Cod. Walleye pollock have a similar distribution to Pacific cod (from Alaska to California) and Puget Sound is thought to be one of the southernmost spawning locations across this range although this has been not well characterized (Gustafson et al. 2000). The degree of population structure of Pacific walleye pollock remains under investigation; earlier work using microsatellites did not find evidence of genetic structure (O'Reilly et al. 2004) whereas more recent work using non-neutral alleles has found evidence for differentiation between Puget Sound and other populations across its geographic range (Canino et al. 2005). Adult pollock are typically found between waters of 100 and 300 m depth and spawn at similar depths, with a lifespan of up to 17 years and a maximum size of up to 100 cm. Pollock eggs and larvae are pelagic, while juveniles and adults feed in surface waters at night and form schools in deeper water during the day although the presence of predators has been shown to shift this behavior to an association with structure such as seagrass (Sogard and Olla 1993). Larvae feed on copepod nauplii (e.g., Canino et al. 1991) while juveniles primarily feed euphausiids and other crustaceans (e.g., Brodeur 1998). Adult walleye pollock opportunistically feed on fishes, copepods and amphipods; a recent study of fish diets in Puget Sound found that walleye pollock stomachs contents were primarily pelagic invertebrates and small mobile benthic feeders (Reum and Essington 2008). Predators of walleye pollock include seabirds, marine mammals and other fish including cannibalistic interactions (summarized in Gustafson et al. 2000). Spiny dogfish are cartilaginous fish in the subclass Elasmobranchii along with sharks, skates and rays and are one of the longest-lived and latest-maturing taxa within this group, with an age-at-maturity of approximately 36 years and a lifespan of nearly 100 years (Saunders and McFarlane 1993). This life history strategy makes them particularly susceptible to overharvesting. While not typically harvested for consumption, they were intensely fished in the Puget Sound region in the 1940s for their oils, which are rich in Vitamin A. They are known to consume a variety of fish including cod and herring as well as crustaceans such as crabs (Jensen 1965). In the Northeast Pacific, a recent tagging study revealed them to be quite migratory, with some individuals utilizing habitats across British Columbia, the Strait of Georgia and Western Vancouver Island (McFarlane and King 2003). As a result of declines in abundance in the Puget Sound population between the 1980s and late 1990s, the inland DPS (Strait of Georgia and Puget Sound) of Pacific hake is currently listed as a Federal Species of Concern and a Washington State Candidate Species (Palsson et al. 1998, Gustafson et al. 2000). If the Puget Sound population becomes recognized as a single DPS, the level of protection may increase. Commercial and recreational fisheries for hake in Puget Sound were closed in 1991 (Gustafson et al. 2000). 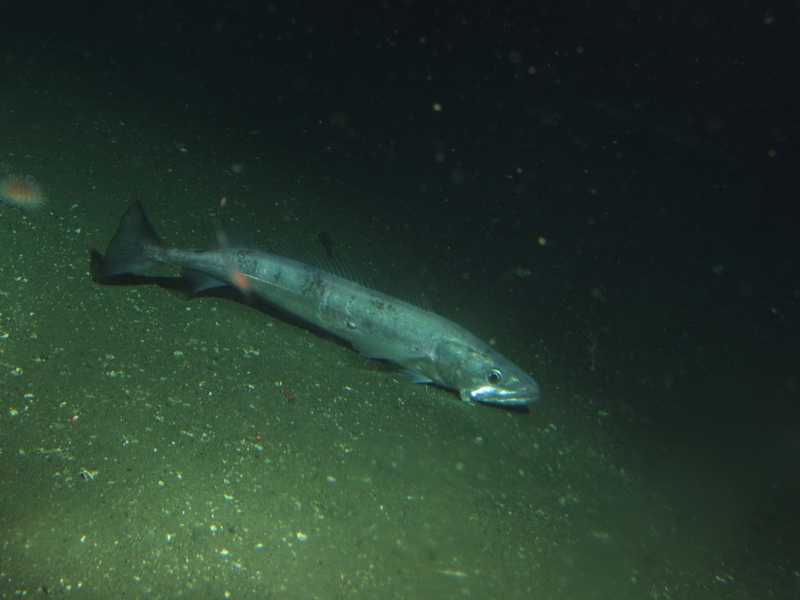 Current population levels of Pacific hake in Puget Sound are not known. Pacific cod are currently listed as a Washington State Candidate Species (Palsson et al. 1998). Concerns over declines prompted the closure of the bottom trawl fishery near Port Townsend and Protection Island in 1991 and a prohibition of recreating fishing takes (Gustafson et al. 2000). However, as with Pacific hake, current population levels of Pacific cod in Puget Sound are not well known but are presumed to be low based on research survey (bottom trawl) and trap catch rates. Walleye pollock, like Pacific cod, are listed as Washington State Candidate species (Palsson et al. 1998), yet current population levels of walleye pollock in Puget Sound have not been assessed. Daily recreational bag limits were reduced to zero in 1997 (Gustafson et al. 2000). Published reports that assess population status of Puget Sound walleye pollock are not available. Pacific hake have undergone a decline in Puget Sound since the early 1980s. WDFW annual hydro-acoustic surveys combined with species composition and length distributions gathered from midwater trawls revealed an estimated 85 % decrease in the Port Susan total spawning biomass from 1983 to 1999 (WDFW data)(reported in Gustafson et al. 2000)(Figure 1). Trends for the Dabob Bay (Hood Canal) spawning population have not been documented (Gustafson et al. 2000). Figure 1. Results of a model predicting population declines (expected) and observed biomass of Pacific hake from WDFW trawls in Port Susan, Puget Sound from 1982 – 2000 (WDFW) (Reprinted from Gustafson et al. 2000; courtesy of NOAA Fisheries). The paucity of fishery-independent data on Pacific cod abundances makes population trends in Puget Sound difficult to assess, yet the decline in landings observed by WDFW and reported in Gustafson et al. (2000) combined with an apparent lack of subsequent reported occurrences suggest that populations in Puget Sound have likely declined substantially since the 1970s. As with Pacific cod, the information available on walleye pollock abundance other than those based on fishery landings are lacking for Puget Sound. Fishing catches peaked in the late 1970s followed by a decline in the mid 1980s (WDFW data) (reported by Gustafson et al. 2000). Taylor and Gallucci (2009) report significant declines in spiny dogfish length and age at maturity and an increase in average fecundity between 1940–2000. However, these authors stressed it was difficult to discern whether these were due to density dependent effects following population declines or from climatic forcing. More information is needed to assess the current population sizes and future trends of all four key bentho-pelagic fish in Puget Sound. Specifically, analysis of long-term trends in abundance, population structure and dependence on environmental conditions is needed to ascertain status and key drivers. Bentho-pelagic fish are important components of marine ecosystems and are often the targets of fishing pressure. In Puget Sound, Pacific hake, Pacific cod and walleye pollock were all once reported to be common and are now apparently much less abundant despite the fact that fishing pressure has been relieved. The direct causes for the declines and for the lack of rebounding are not well understood. All of these species are known to be susceptible to biophysical forcing and climatic regime shifts (Anderson and Piatt 1999, Hunt et al. 2002, Agostini et al. 2006, Agostini et al. 2008), and because Puget Sound cod and walleye pollock are at the southernmost extent of their range, these impacts may be particularly pronounced. Spiny dogfish, as an extremely long-lived shark has been shown to be susceptible to even low fishery pressure (Taylor and Gallucci 2009). Agostini, V. N., R. C. Francis, A. B. Hollowed, S. D. Pierce, C. Wilson, and A. N. Hendrix. 2006. The relationship between Pacific hake (Merluccius productus) distribution and poleward subsurface flow in the California Current System. Canadian Journal of Fisheries and Aquatic Sciences 63:2648-2659. Agostini, V. N., A. N. Hendrix, A. B. Hollowed, C. D. Wilson, S. D. Pierce, and R. C. Francis. 2008. Climate-ocean variability and Pacific hake: A geostatistical modeling approach. Journal Of Marine Systems 71:237-248. Anderson, P. J., and J. F. Piatt. 1999. Community reorganization in the Gulf of Alaska following ocean climate regime shift. Marine Ecology-Progress Series 189:117-123. Bailey, K. M., and J. Yen. 1983. Predation by a carnivorous marine copepod, Euchaeta elongata Esterly, on eggs and larvae of the Pacific hake, Merluccius productus. J. Plankton Res. 5:71-82. Brodeur, R. 1998. Prey selection by age-0 walleye pollock, Theragra chalcogramma, in nearshore waters of the Gulf of Alaska. Environmental Biology of Fishes 51:175-186. Canino, M. F., K. M. Bailey, and L. S. Incze. 1991. Temporal and geographic differences in feeding and nutritional condition of walley pollock larvae Theragra chalcogramma in Shelikof Strait, Gulf of Alaska T. Marine Ecology-Progress Series 79:27-35. Canino, M. F., P. T. O'Reilly, L. Hauser, and P. Bentzen. 2005. Genetic differentiation in walleye pollock (Theragra chalcogramma) in response to selection at the pantophysin (PanI) locus. Canadian Journal of Fisheries and Aquatic Sciences 62:2519-2529. Cunningham, K. M., M. F. Canino, I.F.Spies, and L. Hauser. 2009. Genetic isolation by distance and localized fjord population structure in Pacific cod (Gadus macrocephalus): limited effective dispersal in the northeastern Pacific Ocean. Canadian Journal of Fisheries and Aquatic Sciences 66:153-166. Gao, Y., G. Bargmann, U. Brand, and D. Noakes. 2005. Stable Isotopic and trace elemental compositions of otoliths and the stock structure of Pacific Cod, Gadus macrocephalus. Environmental Biology of Fishes 74:335-348. Gustafson, R. G., W. H. Lenarz, B. B. McCain, C. C. Schmitt, W. S. Grant, T. L. Builder, and R. D. Methot. 2000. Status review of the Pacific Hake, Pacific Cod, and Walleye Polluck from Puget Sound, WA. NOAA, Department of Commerce. Hunt, G. L., P. Stabeno, G. Walters, E. Sinclair, R. D. Brodeur, J. M. Napp, and N. A. Bond. 2002. Climate change and control of the southeastern Bering Sea pelagic ecosystem. Deep-Sea Research II 49:5821-5823. Iwamoto, E., M. Ford, and R. Gustafson. 2004. Genetic Population Structure of Pacific Hake, Merluccius productus, in the Pacific Northwest. Environmental Biology of Fishes 69:187-199. Jensen, A. L. 1965. Life history of the spiny dogfish. Fishery Bulletin 65:527-554. Mackas, D. L., R. Kieser, M. Saunders, D. R. Yelland, R. M. Brown, and D. F. Moore. 1997. Aggregation of euphausiids and Pacific Lake (Merluccius productus) along the outer continental shelf off Vancouver Island. Canadian Journal of Fisheries and Aquatic Sciences 54:2080-2096. McFarlane, G. A., and R. J. Beamish. 1985. Biology and fishery of Pacific whiting, Merluccius productus in the Strait of Georgia Marine Fisheries Review 47:23-34. McFarlane, G. A., and J. R. King. 2003. Migration patterns of spiny dogfish (Squalus acanthias) in the North Pacific Ocean. Fishery Bulletin 101:358-367. O'Reilly, P. T., M. F. Canino, K. M. Bailey, and P. Bentzen. 2004. Inverse relationship between F-ST and microsatellite polymorphism in the marine fish, walleye pollock (Theragra chalcogramma): implications for resolving weak population structure. Molecular Ecology 13:1799-1814. Palsson, W. A. 1990. 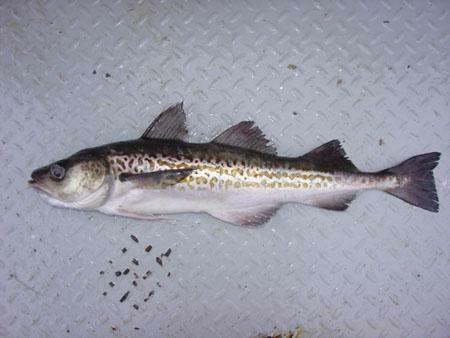 Pacific cod (Gadus macrocephalus) in Puget Sound and adjacent water: biology and stock assessment. Washington Department of Fish and Wildlife, Olyumpia, WA. Palsson, W. A., T. J. Northup, and M. W. Barker. 1998. Puget Sound groundfish management plan (revised). Washington Department of Fish and Wildlife, Olyumpia, WA. Pedersen, M. 1985. Puget Sound Pacific whiting, Merluccius productus, resource and industry: An overview. Marine Fisheries Review 47:35-38. Reum, J., and T. Essington. 2008. Seasonal variation in guild structure of the Puget Sound demersal fish community. Estuaries and Coasts 31:790-801. Saunders, M. W., and G. A. McFarlane. 1993. Age and length at maturity of the female spiny dogfish, Squalus acanthias, in the Strait of Georgia, British Columbia, Canada. Environmental Biology of Fishes 38:49-57. Sogard, S., and B. Olla. 1993. The influence of predator presence on utilization of artificial seagrass habitats by juvenile walleye pollock, Theragra chalcogramma. Environmental Biology of Fishes 37:57-65. Taylor, I. G., and V. F. Gallucci. 2009. Unconfounding the effects of climate and density dependence using 60 years of data on spiny dogfish (Squalus acanthias). Canadian Journal of Fisheries and Aquatic Sciences 66:351-366.